Bonus post? Yes. Here's the deal... with only doing one (GF) recipe per week, I'm completely bogged down. My hard drive is *full* of pictures of food that I want to share with you. I've decided that maybe in addition to GF Friday, I may share one recipe extra per week... because... why not?? 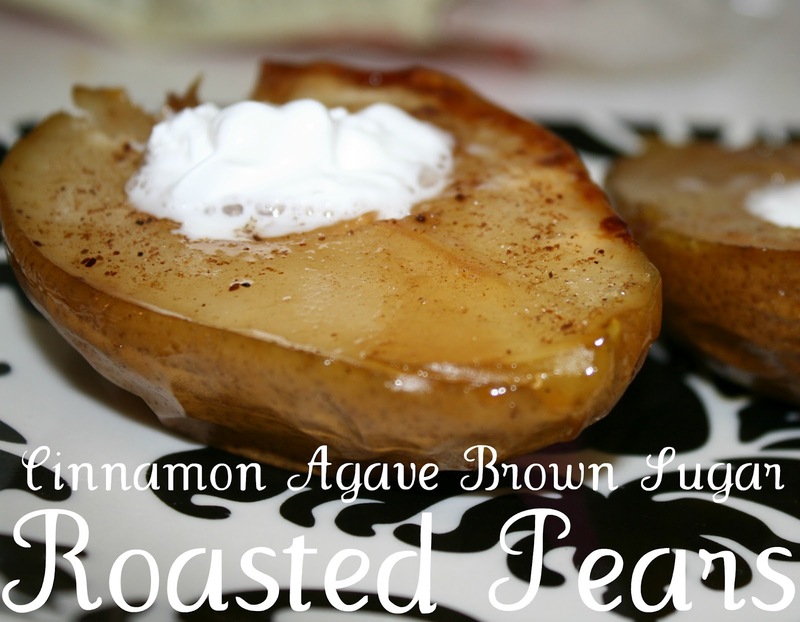 These roasted pears are up first. I saw a recipe for these ONLINE and thought they looked delicious. I always link back to my inspiration, but I especially want you to pay attention to this link. 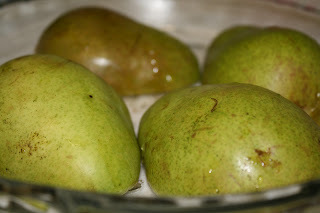 If you don't mind extra work and you reallyyyy like real whipped cream, she has a great recipe to add to these pears. If you want a faster (and much lighter on the waistband...) version, then keep reading! These were extremely easy and so delicious. In fact, I'm planning on giving them a second go tonight. I can't get enough of them! For my version, I skipped the homemade whipped cream (which they don't really even need) and spiced up the actual pear with cinnamon & agave. (1) Prep them. Wash your pears (1/2 -1 per person) and slice them in half. Cut the seedy section out of the center. You'll also want to remove the stem. (2) Stuff them. 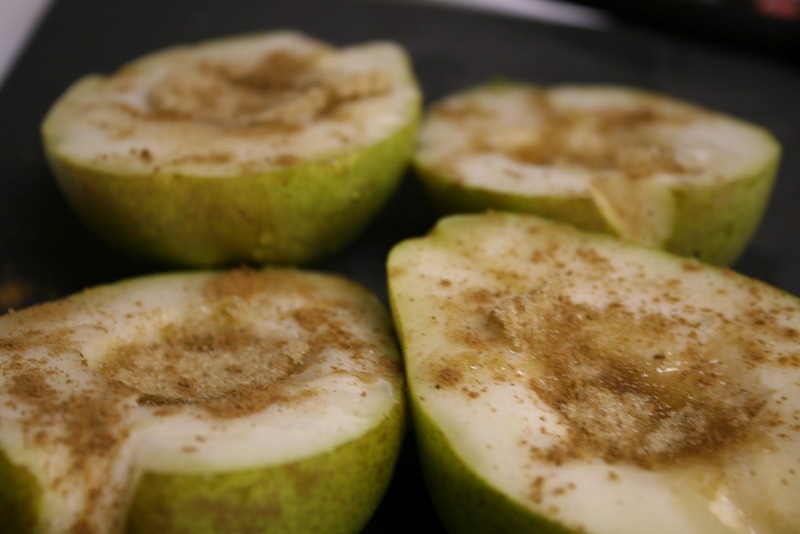 Take a tablespoon of brown sugar and pack it into the center of each pear. Next, dust the pears with cinnamon, or a spice mix (cinnamon, clove, ginger, nutmeg, cardamom, etc.). Finish off with a drizzle of agave (or honey). (3) Bake them. Toss them in the oven at 400 degrees for 35-40 minutes, face down. I ran a stick of butter over a glass pie pan, which worked really well. Make sure you use some sort of grease + glass combo. (4) Top them (optional). 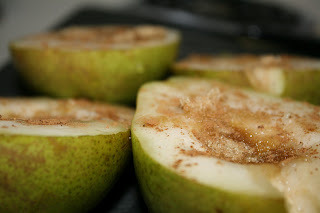 Add a little whipped cream on top and a bit more cinnamon- or else, just enjoy! They were incredible. I can't begin to explain how delicious our home smelled while these were baking to perfection in the oven. 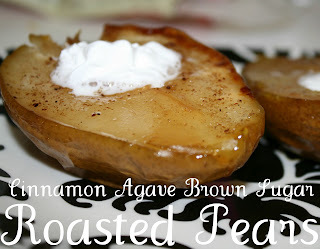 I strongly encourage you to try these, especially since they're one of those recipes that you *really* can't mess up! This is officially my last post for today! I have to start getting ready for tomorrow ;) Wishing you all the best and as always, thanks for reading! ** Update: we made them again tonight. Divine. Word to the wise? There should be some leftover sauce in the bottom of the dish. Spoon it back on to the pears before you serve them. And by all means, serve them warm. Beyond good. Thanks for the shout out! I'm so glad you liked them - I made them AGAIN last night. My friend and I were joking about how whipped cream is SO delicious, but so bad for you at the same time - hehe. I should try them without the whipped cream next time too. always link back- it should be a blogging rule!! Especially with a whipped cream recipe like that, which goes way beyond pears. 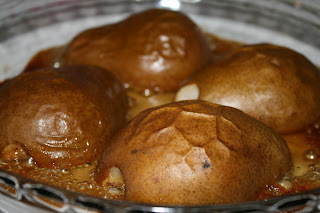 You should definitely try them without, they were stinking awesome just in their own glory, too! It's good news for all of those allergic to dairy, like me.